Rich gave me my first three day win, and was the first event horse I ever owned. If I had him now he would have been a proper horse, but I lacked knowledge then and he forgave me all my faults and gave me the desire to try and pursue a career as an event rider. Garth was my first ‘serious horse’. Neale Lavis gave him to me when I worked with him. No oil painting, Garth was a big gangly horse with a big white face and roman nose. I remember saying to Neale when he offered him to me for free (!) that I couldn’t ride something that ugly; Neale said ‘don’t you worry about that, that big horse is athletic and that’s what you’ve got to worry about’. He could gallop and move, but wasn’t the most careful horse show jumping, something I learned to live with. 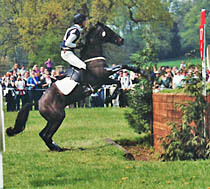 Dougie was only 15.3hh, a wirey black New Zealand Thoroughbred. He wasn’t the most talented horse I’ve ever sat on but he had a heart the size of a lion and he was an out and out trier. 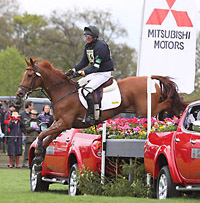 I bought him as a proven 3 star horse for long time supporter Ann Smurfit who was keen to have a horse at Badminton. 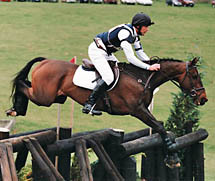 Dougie gave me my first ride around Badminton in 2000: it wasn’t pretty, with several hairy moments most noteably at the Lake and the Footbridge, however we made it round with a few time penalties and ended up 15th which I was made up about for my first attempt. One of the most talented horses I’ve ever had but one of the most unlucky. 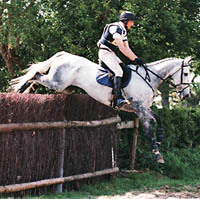 A beautiful grey intermediate horse, athletic over a fence and with great movement he was an Australian throughbred I found in Western Australia. Charlie is probably the most successful horse I’ve had to date. He wasn’t much to look at, a small 16hh bay Australian thoroughbred, but he had an amazing engine and number of gears. The best galloping horse I’ve ever had, light on his feet and didn’t pull – he skipped across the ground and was consequently very fast. He was brave and a real competitor, and although he didn’t have the greatest movement in the world, I got lots of help and learned to ride him very correctly which meant he was never far behind after the dressage. His strength was his cross country and he gave me some of my best cross country rides to date. He completed many three days, placing second at Necarne 2 star, 10th at Blenheim and Burghley, and completed Badminton to name but a few. Clancy was a failed racehorse, an Australian thoroughbred I bought off the track. 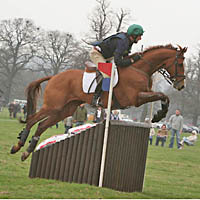 He started eventing late in life at 8 but took to it from the beginning, winning Necarne CCI* in 2000 and coming third at Windsor CCI** in 2001. He was a big impressive chestnut horse who had it all: looks, jump, movement and gallop, but he was a bit lalah in the brain, a few sandwiches short of a picnic some would say. I’ll never forget being in the counted down for phase D at Windsor with Clancy eating the foliage in the start box – I had to tear him away! He had the talent for 4 star but not the desire, his comfort zone was 3 star and he gave me some good results at Saumur, Bramham, and several Advanced wins including Gatcombe. Another antipodean thoroughbred, an older horse I bought from Chris Burton when he returned to Australia, for long term owners who wanted a horse at the top level. He was extremely elegant and talented, a flashy bright chestnut with four white socks and white spots similar to Toy Town. He had a gallop that reminded me of Charlie but he was much more fragile in the brain and lived life on the edge. 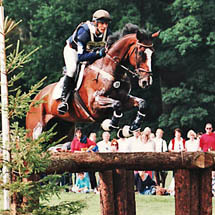 A tall and talented New Zealand thoroughbred I bought at intermediate level for a syndicate of owners in 2001. He in many ways reminded me of Charlie – but the super size version. 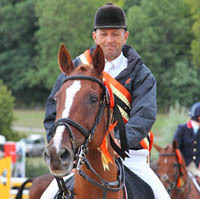 He was a four star/three day event horse and not well suited to the one day format. He came in to his own on long galloping tracks as he had an effortless gallop stride and scope to burn giving me the most effortless four star cross country ride I’ve ever had in difficult conditions. He was tricky on the flat as he was very highly strung and found dressage difficult as laterally he was not the most supple. I wish I’d had him from the start as a young horse. Nina was the first and only horse I’ve bought for us without Jenny! I loved her from the first moment I saw her, and I can’t really explain why. She came from Vere and Clea Philips as a young horse. She was a complex horse, loved people, and hated other horses. She had it all in terms of ability, elegance, stamina, movement, jump, blood and gallop. She was a horse that I loved to work with – I really enjoy the process of producing a young horse and this is one of the horses I’ve most enjoyed producing. She could do it all easily once she understood what was being asked of her. However she was an adrenalin junky especially cross country. She would gallop and jump but hated to be held up to a fence. We connected and she was comfortable with my riding style especially across country and we formed a good partnership. 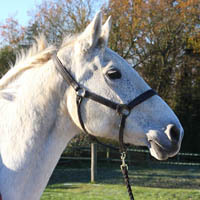 Madge came to us in the twilight of her life at 18 years young, a 16.2hh grey mare of unknown breeding that we had been given. 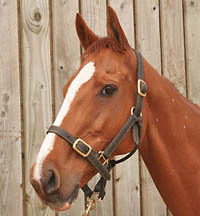 We had been blessed (third time lucky) with getting her in foal to Hand In Glove, with the foal due late August 2011. She was a real character, adoring polos and ruling the roost! We were given her by the How family which we were very grateful to them for. 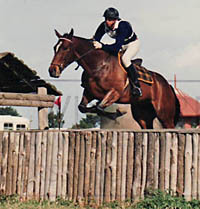 Bill rode her a few times during her competitive career on behalf of Philip Adkins and she was a real competitor with lovely paces and a great jump. He had always loved her and wanted to breed a foal from her. We had been very excited to see what her foal would turn out like. Sadly in early December 2010 we lost her to a freak accident – a great loss. I was given the ride on Sunny in 2011 by Caroline Edwards and Pam Scott, having admired him from across the collecting ring for several years. We won Hartpury CCI** and I believed he had the ability to be a top four star horse. 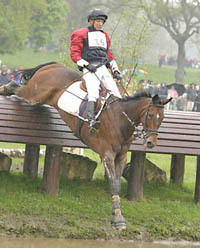 He was selected for the Eventing Futures squad for 2012 by Equestrian Australia but devastatingly suffered a freak accident in his stable. Hipp, owned by the Leggetts, was on the Elite Squad for the Australian team and narrowly missed selection for the London Olympics. 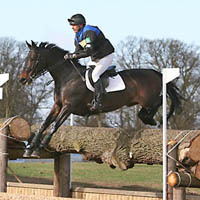 He finished 7th at Badminton in 2010 and was always a great favourite of mine. He retired at the age of 17 having won almost 700 BE points. Very sadly he broke his leg in a tragic accident at his retirement home. I owe Hipp more than words can say. He was all heart and dug deep. Once you had his trust he would do anything for you.